MBF Bioscience now offers customized models of Huron Digital Pathology’s TissueScope™, a line of whole slide scanners, and supports TissueScope images across its range of analysis software. October 23, 2018 – Huron Digital Pathology and MBF Bioscience are proud to announce their partnership to offer customized models of Huron’s TissueScope whole slide scanners integrated with MBF’s Stereo Investigator® – Whole Slide Edition, NeuroInfo®, Biolucida®, and BrainMaker® software. The partnership gives researchers new tools to visualize and analyze tissue specimens throughout entire organs, large and small, at high-resolution. Every year, we look forward to showcasing our new products and latest developments at the Society for Neuroscience’s annual meeting. This year, from November 3 – 7, we’ll be at SfN 2018 in San Diego, at Booth #2235, where our team of expert scientists and engineers will be on hand to offer personalized demonstrations of all of our products. This year, we are thrilled to introduce two major new software solutions: Vesselucida 360, an application for reconstructing microvascular networks in 3D, and NeuroInfo for automatic identification of brain anatomy in your sections. Williston, VT – September 5, 2018 – Researchers studying microvascular networks and vessels have a groundbreaking new software application to facilitate their work. Developed by MBF Bioscience, Vesselucida® 360 automatically reconstructs and analyzes microvascular networks in 3D. Specifically designed to recognize the intricacies of the vascular system, Vesselucida features sophisticated algorithms that quickly and accurately create 3D reconstructions of images and tissue specimens. Built-in analyses provide data on segments and node counts, frequency of anastomoses, as well as metrics on vessel surface and volume. 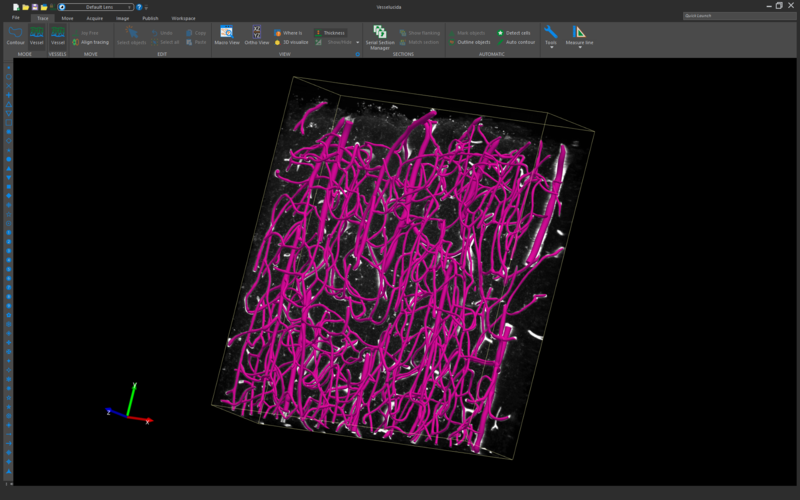 Vesselucida 360 also features a full suite of tools, which lets researchers manually trace and edit 3D reconstructions to fine-tune particularly complex image data. Companion analysis software, Vesselucida Explorer performs sophisticated data analysis for scientists seeking answers to their most challenging research questions. Williston, VT – June 29, 2018 – MBF Bioscience is pleased to announce the launch of the Whole Slide Edition of Stereo Investigator. This is a new version of our renown Stereo Investigator software, designed especially for conducting stereology on images from slide scanners. Featuring a streamlined, user-friendly interface, this new product includes a variety of probes for quantifying number, length, volume, and surface area of cells, structures, and regions of biological tissue. The software works with all 2D microscope images, and is an especially attractive solution for researchers who work mostly, or exclusively, with slide scanners. “We’re very excited about the opportunity this gives to many of our customers who want to use stereology to perform quantitative analysis of their whole slide image data. Stereo Investigator – Whole Slide Edition provides a powerful, lower-cost version of Stereo Investigator with a user interface designed specifically for 2D image data,” says MBF Bioscience Director of Sales & Marketing Mark Barton. For over a decade, Stereo Investigator has been considered the gold standard for carrying out stereological studies on biological tissue, and is cited in peer reviewed publications ten times more than any other stereology system. With the release of Stereo Investigator – Whole Slide Edition, MBF Bioscience continues its dedication to further assisting the research of our valued customers. 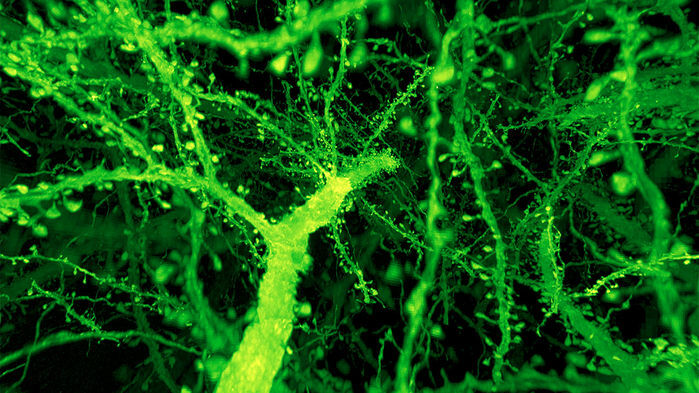 With the release of its new version on November 28, NeuroMorpho.org adds 9,987 new images to its archive, bringing its impressive collection of digitally reconstructed neurons to 80,012. 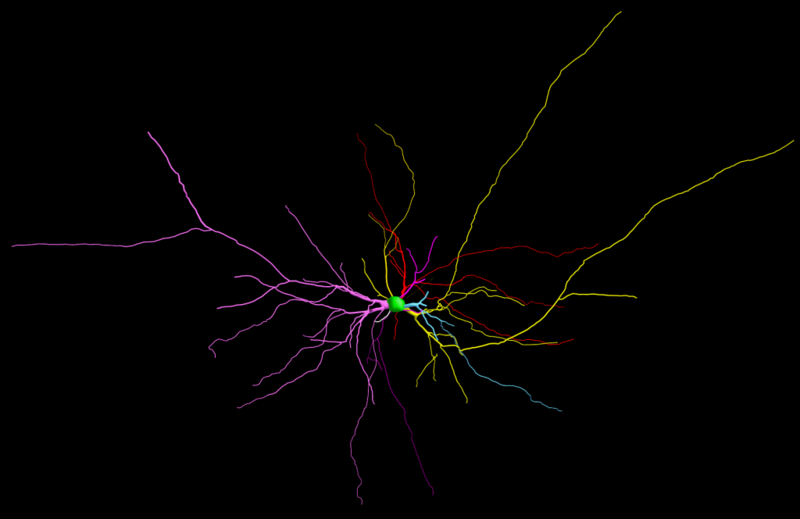 Scientists used MBF Bioscience’s software, Neurolucida and Neurolucida 360, to reconstruct the majority of these cells. In fact, 64 times more neurons were reconstructed with MBF Bioscience software than those imaged by our closest commercial competitor – that’s 42,121 reconstructions compared to 656. This metric demonstrates that Neurolucida and Neurolucida 360 are truly the gold standards for neuron reconstruction. 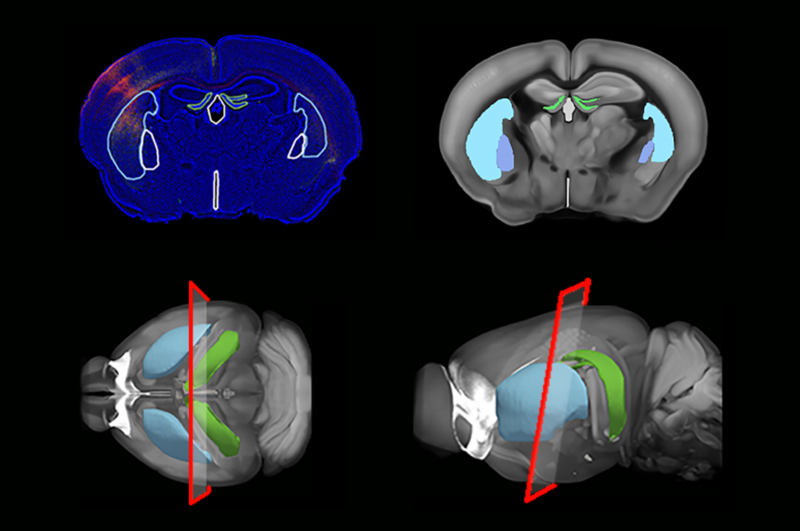 Featuring contributions from hundreds of laboratories from around the globe, NeuroMorpho.Org is the world’s leading database of publicly accessible 3D neuronal reconstructions and associated metadata. From the dragonfly to the humpback whale, researchers have access to accurate and verified data from an array of different organisms. 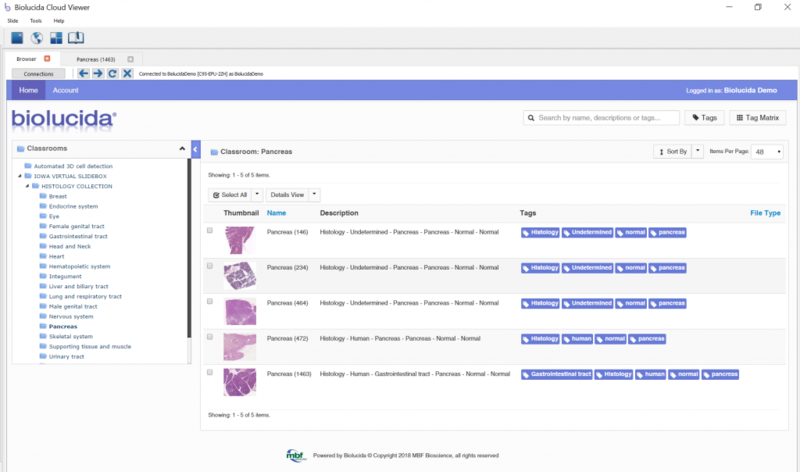 Arranged by animal species, brain region, cell type, or contributing laboratory, each file contains specific details about the cell’s morphology such as age, developmental stage, soma volume, and number of branches – all of which are searchable. The SfN 2017 meeting is the culmination of an exciting year of new technological achievements at MBF Bioscience. Our new version 2017 of Neurolucida, Stereo Investigator, and Neurolucida 360 features a totally re-designed interface and has been an overwhelming success with our customers. We’ve also expanded the stereology family with Stereo Investigator Cleared Tissue edition and Stereo Investigator Whole Slide Imaging edition. And we have received wide enthusiasm for our new optogenetics stand for WormLab, our worm tracking software. Come see our innovative new system that includes a high-speed, 4-channel laser confocal scanner for fast confocal whole slide imaging in both 2D and 3D. It is creating a new paradigm for big data image acquisition and analysis. You simply will not believe the slide scanning speed we will be demonstrating for confocal imaging. Curious about new technologies for microvasculature analysis? Come and discover Vesselucida. Tired of using a printed brain atlas and wish there was an easier way to identify the brain anatomy on your sections? Imagine technology that can automatically identify the anatomical region on your sections by just clicking on it! Come see our new automatic brain mapping technology that matches serial sections of mouse brain to the Allen Brain Atlas. Visit us at booth #1637 to see the latest advancements in quantitative neuroscience research and learn how our “End-To-End” solutions for Image Acquisition – Image Management – Image Analyses will revolutionize the way you make your next discovery. 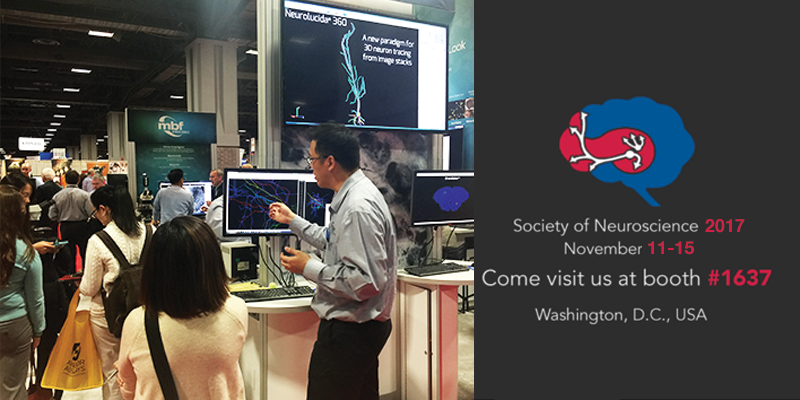 If you’ve visited our booth at SfN before, you know how busy we can be. If you’d like to schedule an appointment to reserve the time to meet with us that works best for you, just use this online form. Or just stop by to see us for a personalized demonstration of any of our software or imaging systems.